A Cardiff man is thanking blood donors across Wales for helping patients in need just like himself, following World Blood Cancer Day earlier this week on Monday 28th May 2018. 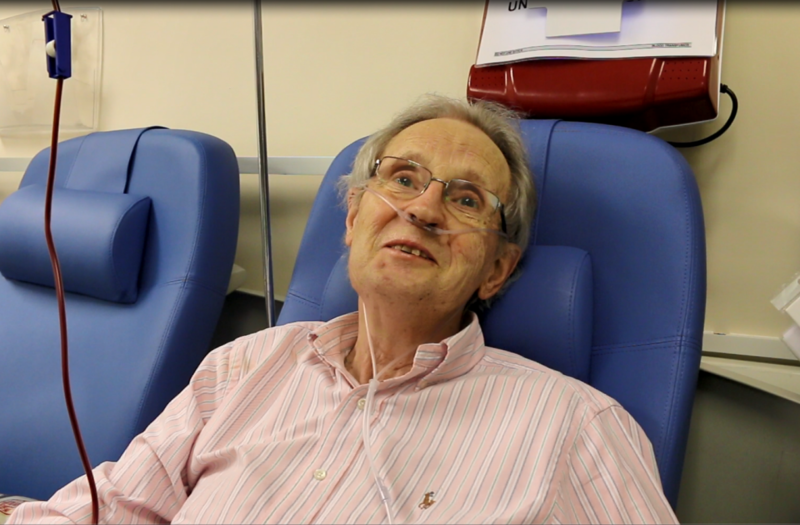 Tony Davies, 80, from Old St. Mellon’s, receives regular blood transfusions at the University Hospital of Wales for Leukaemia, one of the most common forms of blood cancer. Every 14 minutes, someone in the UK receives the news that they have been diagnosed with blood cancer. Following the treatment needed to fight the cancer, blood transfusions can be used to stop a patient feeling tired and breathless. Only three per cent of the eligible population in Wales currently give blood, and Tony is hoping that sharing his experience will let people who donate know how valuable the gift of blood is. “It does make a difference, it really does make a difference to people’s lives.” Tony added. Unlike medicine, blood products cannot be made in a laboratory and it is essential that people give blood for patients to receive transfusions during their cancer treatment. Help someone like Tony who is fighting blood cancer by booking an appointment to donate: visit welshblood.org.uk or call 0800 252 266 today.